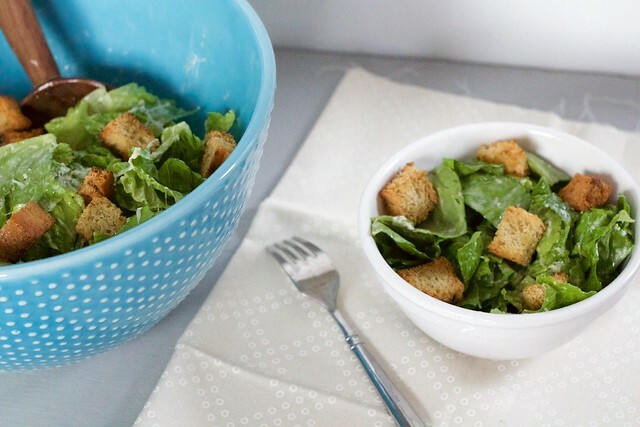 These croutons and caesar dressing are.the.best.ever. I know, I know, it's all a matter in opinion. But really, I tried this dressing and I nearly fainted it was so good. I couldn't wait for lunch to come the next day so I could have left overs. It's creamy, and delicious. I opted to not put in the anchovies because it seemed a bit unnecessary, and slightly unappetizing (in my opinion). This is perfect for a hot summer day BBQ or as light meal, and it makes a great side salad for any main dish. The homemade croutons complete the salad. They are crunchy goodness. My kids immediately pick them out of the salad, (do you blame them though?) and I couldn't keep my husband's fingers out of the pan after making them! Preheat the oven to 325 degrees. Have ready an ungreased cookie sheet. Place the bread cubes in a medium sized bowl. Toss in the olive oil, melted butter, garlic powder, and parsley. Mix until coated. If the bread looks a little dry, drizzle on a little more olive oil, but make sure the pieces aren't saturated. Spread the bead pieces onto the pan in a single layer. Sprinkle with kosher salt. Bake for 15-20 minutes, stirring once half way through, until golden brown. Let cool completely on the cookie sheet before serving. In a food processor, put in the garlic clove and pulse several times until minced. Add the buttermilk, lemon juice, mayonnaise, mustard, Worcestershire, salt, and pepper and blend until smooth. With the motor running, add the oil until incorporated. Add the parmesan cheese and pureé until mostly smooth. Serve. Store in an air-tight container in the fridge. 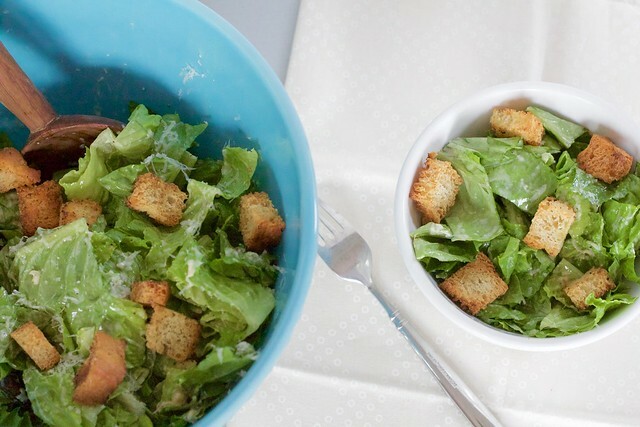 To assemble a caesar salad, chop up 3-4 heads of romaine lettuce, mix in croutons, salad dressing and desired amount of shredded parmesan cheese, and enjoy!